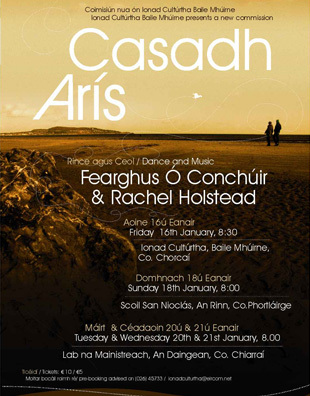 Casadh is a collaboration between composer, Rachel Holstead and choreographer Fearghus Ó Conchúir that mines their shared experience as translators. Brought up bilingually, both share an understanding of what it is to vibrate between two cultures, two points of view. Both have experienced the responsibility of being communicators and the energy of that conduit position. In Casadh, the Irish word for turning and for singing, they endeavour to find the common language that unites their separate art forms, and they share that language with the gaeltacht communities in which they grew up.